Folks, it looks like I'm going to Cleveland this weekend. Whos in Cleveland this weekend and wanna hit the field? Throw, catch and run some routes? Ohio State finds itself needing a starting safety once again. The fastest damn offense in the land. Biggest questions entering spring practice. Michigan players have nothing but good words for Greg Mattison. The Buckeyes rose their draft stock. Word of the Day: Nudnik. BEST TO EVER PLAY THE GAME. There are some extremely varied opinions about Dwayne Haskins. Some see him as an overrated prospect benefitting from a soft quarterbacks class, others see him as a generational talent that would have even topped last year's quarterback-heavy class. But the guy who's probably spent more time working with and studying Haskins than every analyst and scout combined has perhaps the strongest #take yet. Ryan Day believes Haskins could be one of the best to ever play the game of football. “The good news is, for two years, he’s been in an offense where it’s going to translate into the NFL, because it’s very NFL-oriented,” Day said “Protections, progressions, route concepts, everything. Being an NFL quarterbacks coach for a couple years, in that room, you’re able to talk about what it means to have protections and defensive structure. He has experience with that. He has exposure to it. The rest of the article is basically just a targeted advertisement for any elite high school quarterback looking to make it to the next level to come to Ohio State. Hell, I was ready to commit on the spot and I can't throw a football more than 30 yards. The more I hear Day talk about quarterback things, the more Justin Fields' decision to come to Ohio State makes complete sense. I don't think there's anywhere else I'd go as an elite quarterback, because I don't think there's another quarterbacks coach like Ryan Day. ALL-COMBINE TEAM. It's a pretty good thing to be considered the best of an already elite group, and that seems to happen fairly often for Buckeyes. Five different Ohio State offensive players were named to NFL.com's all-NFL Combine team with their performances in Indy this weekend. So basically, a draft shortcut would be to just select the highest-rated Buckeye on the board whenever you're on the clock. BACKING THEIR WAY IN. This college basketball season is hilarious. Ohio State is 6-10 since the New Year, has an 8-10 conference record and just lost by 35 points and is still decidedly in the tournament field and not even in the "Last Four In," according to Joe Lunardi of ESPN. There's no way the Buckeyes deserve to make the tournament at this point, and David Briggs of the Toledo Blade has a plan to make sure it doesn't happen again. To spare the committee the grief of deciding between Second-Rate State, Tepid Tech, and the University of Blah, there is an easy and overdue fix. It is time, once and for all, to require — like a football team needing six wins for bowl eligibility — at-large hopefuls finish .500 or better in their conference regular season. Truth is no one but their own fans wants to see the 10th-place team from the Big Ten play the eighth-place team from the Big 12 in the First Four in Dayton. The magic of the tourney is the little guys earning their big shot, and the more Cinderellas — and less power-conference flotsam — the better. I agree with this #take in principal. I'd rather watch a good mid-major team in the tournament than a terrible major conference team any day. The big problem this year is, there aren't many good mid-major teams, either. I don't think Ohio State deserves to be in the tournament this year, but the solution probably isn't just tossing Siena in there instead. And it's not like the other teams from major conferences on the bubble are anything close to deserving, either. FORGOTTEN LEGEND. Yesterday, I was perusing the 'ole Ohio State men's men's basketball Wikipedia page – as one does in March – and I stumbled across a legendary player I've somehow never heard of, even though he made history in some games I actually attended! 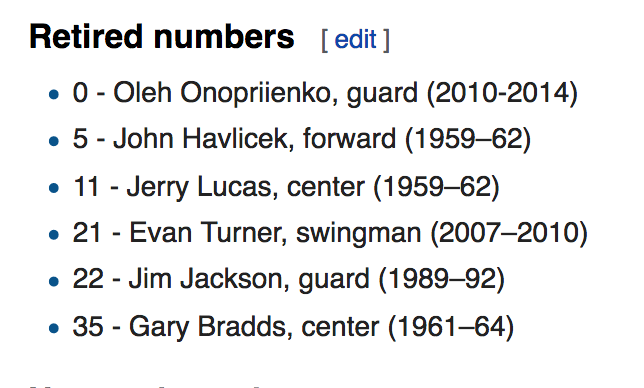 I went to almost every home basketball game during the 2013 and 2014 seasons and I never knew Oleh Onopriienko even existed, much less had his number retired! It must have been wild sharing the number with both Jared Sullinger and D'Angelo Russell during his career. I don't know how they pulled that off. 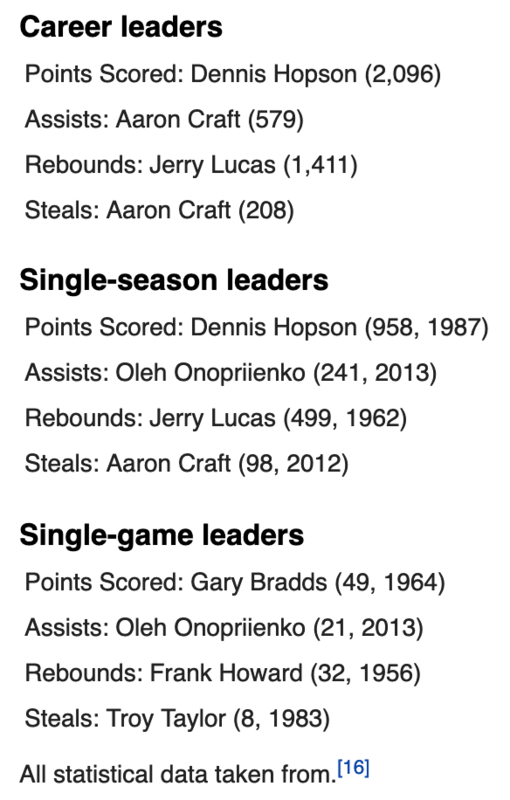 As you would expect from someone with their number retired, Onopriienko is also in the Ohio State record book. The strangest part about all of this is I seem to vividly remember Shannon Scott owning one of those records. This is the wildest example of the Mandela Effect I've ever personally experienced. It's like history has just be rewritten. I know Wikipedia trolls happen all the time, but I really appreciate the nuances and the dedication to this one. Whoever did this didn't just toss a random joke name in one section, they basically created an entire false history for this individual, giving him records, stats and even working him onto the roster page of the 2011-2012 Wikipedia page with a height, weight and hometown of Dnipropetrovsk, Ukraine (although they also listed him as a senior when everyone knows his senior year was in 2014 smh). The best part about all of this is that there's no clear motive. Whoever did this just inserted a fictitious Ukrainian guard into recent Ohio State basketball history, for some reason. And they covered their tracks, too – the IP address behind the edit is from Ukraine. As far as the name goes, the only thing I can find on the Google Machine is this fellows Twitter account by the same name and this Ukrainian serial killer that shares the same last name. Regardless, this is now my favorite Ohio State basketball player and I wish with everything inside of me that he was actually real. I'm considering having a jersey made. I left all the edits to the Wikipedia page as-is because I just couldn't bring myself to delete an artist's hard work, so somebody else will have to clean it up. ODEN GETTING THAT PAPER. Moving on to someone who actually did play basketball at Ohio State, Greg Oden is about to get his degree. I love the Degree Completion Program. It exists almost purely for the benefit of the players, and Oden is the perfect example of how it can work. With his injury history, he had an extremely short ticking clock counting down the time he could get paid to play basketball. And thankfully, by choosing to cash in on the few healthy years he had, he also didn't have to ruin his chances at getting a degree because of this program. Kudos to Oden for coming back and putting in the work.